The Bolivarian Republic of Venezuela finds itself threatened yet again by acts of political violence from sectors of the extreme right as part of a destabilizing plan elaborated by North American imperialism. This plan has as its objective the imposition, through force and blackmail, of a government which would work to maintain US hegemony throughout the continent. Such a government would dismantle the process of national liberation which began across Latin America at the start of this century. It would turn back progressive advances by which the working class and the people in general have won rights historically denied them by governments controlled by the bourgeoisie, which itself acted as a subordinate to North American imperialism. On this occasion, the aggression of the oligarchs and the extreme right is even greater. Apart from economic violence against the people, resulting in the creation of shortages and the high cost of living, terrorist acts have been committed in various cities across the country in recent weeks. This terrorism has been accompanied by a national and international propaganda war, designed to sow confusion and instigate confrontation between nations. Imperialist forces aim to create a state of chaos and violence, whose outcome is a bloody resolution of the political crisis, either through a coup or by direct intervention by North American imperialism and the international institutions at its beck and call. The Venezuelan extreme right, following instructions from US imperialism and with its direct financing, has no qualms about using crime, violence, and provocation. We call on the patriotic soldiers and officers to not cede to these unpatriotic terrorists. We call on them to take up the defense of our national sovereignty, our independence, and the security of our people without hesitation and with complete commitment. For us, the Venezuelan communists, it is clear that what is happening is the sharpening of the class struggle in its political form — the heightening of the struggle for power. The forces which represent the interests of European and North American monopoly capital are attempting to take over control of Venezuela and all Latin America. They do this by defeating the social and political sectors which offer resistance to such objectives. In light of the dangerous terrorist escalation, which is putting our national sovereignty, independence, and the gains of the working people at risk, we call for a unified, forceful, and coherent response. It is necessary to mobilize without delay the widest possible anti-imperialist alliance to defeat the antidemocratic terrorist plans. It is necessary to develop a people’s patriotic plan to defeat the pro-imperialist and terrorist extreme right. Failing to do so would be irresponsible, no different from surrendering without a fight. The true revolutionaries do not surrender; we fight united until we win. The Venezuelan working class needs the petit-bourgeois sectors which currently hold power in the national executive, the other powers of state, and parties of government, to abandon all sectarian and selfish conduct. Such conduct weakens the Bolivarian process and effectively works in favor of the enemies’ plans. 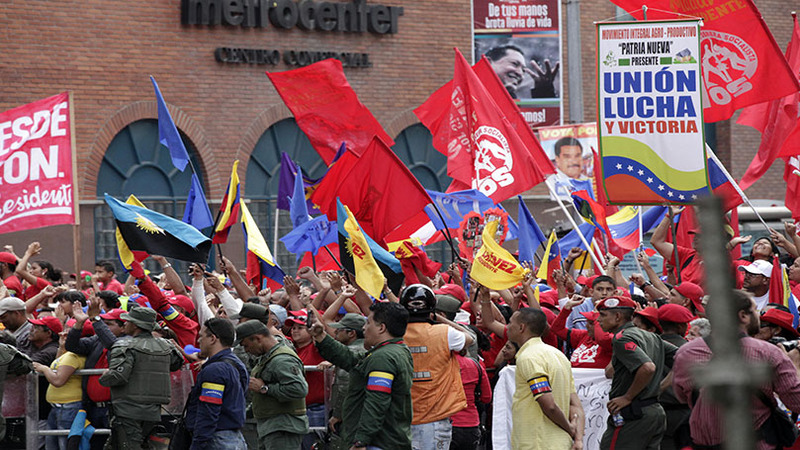 The Communist Party of Venezuela has insisted for many years for the need for a collective and unified national leadership of this Bolivarian process of changes, but the petit-bourgeois groupings which have exercised hegemonic control over the government have not paid attention to these calls and proposals.